I have been an on and off runner for many years. The first time I started running was when I was 12 years old. Considering I am 24 right now, that is a significant fraction of my life. I have always enjoyed running and the benefits that come with it, but what I always lacked is the consistency. This probably stems from my lack of motivation often times to go out and run. Sometimes I am just a lazy bum and I am very sure a lot of people can relate to this. Sometimes the comfort of your couch is just too overwhelming. So I decided to join and contribute to the blog as a way to keep myself motivated. It also gives me a sense of community with other fellow runners who also want to take up the sport. Ability to tolerate somewhat greater changes in body water content than many other animals - a marathon runner may sweat off 3% of their body mass during a race. Ability to breathe through the mouth while running. 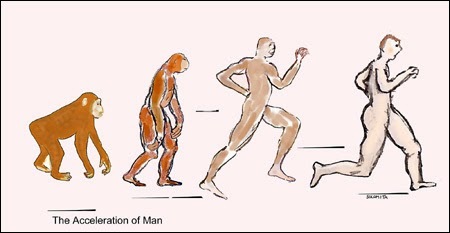 Scientists believe that being able to run for extended lengths of time is an adapted trait, most likely for obtaining food, and was the catalyst that forced Homo erectus (our ancestors, we are Homo sapiens) to evolve from its apelike ancestors. Over time, the survival of the swift-footed shaped the anatomy of modern humans, giving us a body that is difficult to explain absent a marathoning past. Our toes, for instance, are shorter and stubbier than those of nearly all other primates, including chimpanzees, a trait that has long been attributed to our committed bipedalism. In a study, it was shown that even an increase in the toe size by 20% increased the amount of energy and shock on the feet drastically. There are tons of other evidence in our skeletal structure to provide endurance and stability while running, the energy storing mechanism of our body etc. to suggest that our ancestors were very good runners. Humans' ability to run is unique among primates. Why running? Because that's how we killed our food. Experts call it persistence hunting. The Homo genus did not develop the most basic projectile – the spear – until 200,000-300,000 years ago. That left our ancestors equipped with little more than sharpened sticks for nearly two million years of carnivorous prehistory. Why is that important? Quadrupeds (four footed animals) cannot pant and gallop at the same time. Their guts are too busy sloshing around like a piston. So, every 10 or 15 minutes, they overheat. When they overheat, animals must stop to cool. But their bipedal pursuers keep on coming. After several stops and starts, the prey succumbs to heat exhaustion or its heart gives out. This is the only explanation of how humans were capable of killing large game before developing projectile weapons. Of course, I can't go to all the details in this single blog post. So, if you find this interesting, please let me know and I will try to do a couple more posts on this. And remember, the next time you think that you can't run, know that you were specifically designed to run marathons and ultra marathons, "Born to Run". If that does not motivate and empower you, then I don't know what will! Very educational and informative. Keep up the good work!